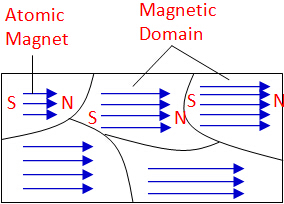 A magnet is made up of many magnetic domains. Magnetic domain is a group of atomic magnets pointing in the same direction. Atomic magnet is represented by an arrow with arrowhead as a North pole and tail as a South Pole. In a ﻿magnetized bar﻿, the magnetic domains are all pointed in the same direction as shown above. The North and South poles of adjacent domains cancel each other out except the poles at the both ends, and hence producing North and South poles at the ends. Note that every magnet has a maximum strength. We say it is magnetically saturated and cannot be any stronger. This occurs when all the magnetic domains pointed in one direction. However, in an ﻿unmagnetized bar﻿, the magnetic domains are pointed in the﻿ random directions ﻿such that the magnetic effects of the atomic magnets are cancelled out. Thus, the bar is not magnetized.